It was late 1998 that Sony’s first CD recorder was released in the company’s home market of Japan. At the time it came as something of a surprise, as Sony had previously intimated that MiniDisc was its rival to Philips’ (then) new CD recordable format, and that as a result, we could not expect a CD-R machine! It was interesting because at the time, MD sales were going great guns in the land of the rising sun and DAT was still a popular high end consumer format. That first machine was a middle of the range ‘ES’ series product selling for around Y60,000 (£350), suggesting that Sony felt MD was a fine budget format and DAT the semi-pro standard, but that there was a gap that needed plugging in the middle. Five years on and the RCD-W3 finally reached British shores. First seen at the 2001 Tokyo Audio Expo, it was priced to sell at just under the £200 mark – pitching it right into the fray. At the time, Sony had gone on record as saying it was still ‘committed’ to the MiniDisc format, but there was a gradual shift downmarket going on. A few years earlier and you could have got an MDS-JA50ES for just a few pence under a thousand pounds, but by 2003 you’d struggle to find a Sony MD hi-fi separate in the High Street for over £150. It was looking increasingly like a niche format, its days of rampant sales now long gone. Into the gap stepped the machine you see before you. Driven by the immense PC computer market, economies of scale enabled CD-R technology to crash down in price. The first hi-fi CD-R recorder introduced by Meridian in the late eighties cost £3,000 and used blanks retailing for £35 a go – the Sony you see before you was under £150 and used the very same media, at just 35p each. That was progress! What then of the RCD-W3? Well, it’s a twin-tray design with a single playback deck and another recorder. The two are linked digitally, allowing 4x copying and finalisation, meaning that an average music CD can be transcribed in about fifteen minutes – Sony reckoned this made it the fastest gun in Europe. The machine can function as a CD multiplayer by using both transports for playback. It plays standard CDs, and reads and writes to CD-Rs and CD-RWs – for recording however, only ‘audio’ CD-R/Ws are accepted. Frankly, there’s not much sign of audiophile tweaking here. It’s an undeniably handsome machine and at 4.6kg not as flimsy as some sub-£200 CD hardware, but neither is it anything special. Its greatest claim to fame are four 24bit ‘Type H Pulse’ DACs and an ‘intelligent disc servo system’ to optimise playback – neither of which are anything to write home about. Its largish fascia (possible thanks to it largish 430x108x451mm dimensions) is very cleanly laid out (in true Sony fashion), making it a breeze to use. Down each flank are each drive’s respective transport controls, while their displays can be found under each disc drawer. A modicum of facilities is provided, including the aforementioned ‘Synchro Start’ high speed dubbing which makes a fully synchronised recording. For optimum sound quality of course, a ‘Normal’ 1x option is provided. Selectable CD play modes, including 32-step programmability, are available, along with CD Text display. A button on the lower right edge of the fascia switches between inputs, comprising one optical digital and one RCA phono analogue. The latter’s level is adjusted by a front panel level pot, in conjunction with the display-mounted peak level meters. Variable line out is available via the bundled Sony RM-R50 remote, and a 6.3mm headphone jack completes the package. 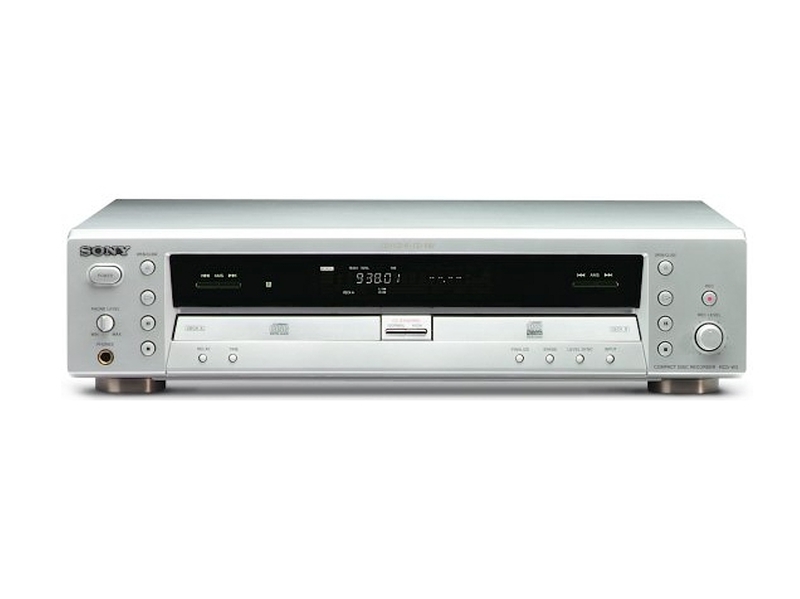 First, as a playback deck, the RCD-W3 was standard turn-of-the-century budget Sony fare. This means a decently smooth, even and musical presentation, with few obvious signs of raggedness, hardness or nastiness. It had a decently fast and tuneful bass, reasonable midband detailing and a couth treble. However, you simply can’t pretend this is anything more than a budget player – in absolute terms midband is thin and one dimensional, bass loose and lightweight and treble a tad too splashy. As a recording deck, at normal speed the Sony made excellent direct digital disc copies. There was very little audible degradation between original and CD-R, which is much as you’d expect when it’s a case of simply sending the digital datastream a few inches down to the burner drive. Ultimately there was a very slight flattening of depth perspective, a subtle lightening and loosening of bass and a softening of treble, but overall nothing to complain about. Would that budget cassette decks have sounded this good! Analogue recordings weren’t anywhere near as encouraging, sounding thin and sterile. Overall though, this was an excellent product given its low price, and can be picked up for peanuts.